In the shadow of the Port Mann Bridge, work is progressing on the challenging Port Mann Main Water Supply Tunnel, in Vancouver, BC, with the recent completion of the project’s South Shaft. Project client, Metro Vancouver, awarded a CA$150 million contract early last year to McNally/Aecon JV (MAJV), a joint venture between McNally Construction and Aecon Constructors, a Division of Aecon Group. Designed to replace the existing subaqueous water main crossing, and provide an earthquake resistant water supply for communities south of the Fraser River, the project involves the construction of a 1km (3,280ft) long tunnel driven at depth of up to 30m beneath the Fraser River between the cities of Coquitlam and Surrey. Groundwater conditions at the tunnel horizon are artesian, making this a challenging project, with expected earth pressures of up to 6 bar. To facilitate the tunnel drive and installation of a 2.1m (6.8ft) diameter welded steel pipe water main, two shafts are being excavated, one on each side of the Fraser River. MAJV started work on the 13m (43ft) diameter South Shaft late last year, with Texas based subcontractor Bencor installing 30 slurry wall panels to a depth of 68.8m (225ft) using a new Bauer BC40/MC128 Hydro mill. Bencor then relocated to the North Shaft where teams have currently installed approximately 60% of the 1.2m wide panels required. 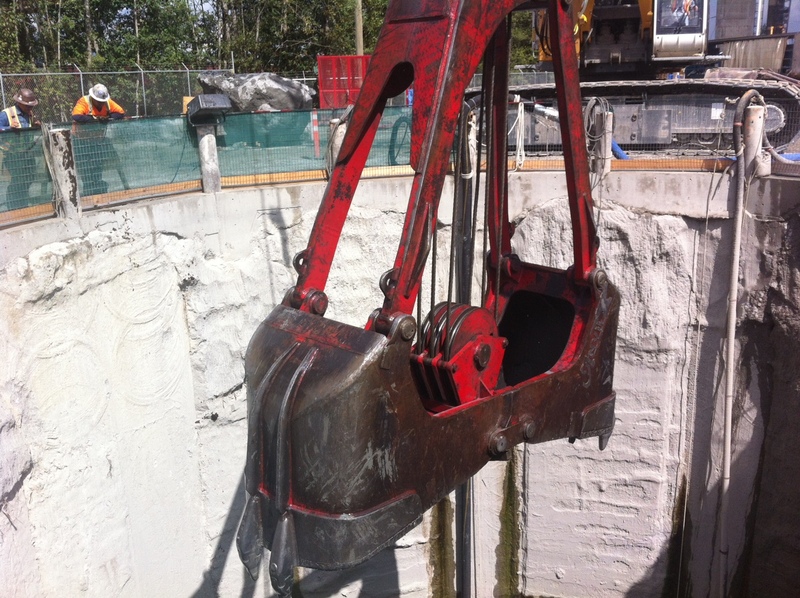 Meanwhile, MAJV excavated the South Shaft using a heavy-duty clam bucket within the flooded shaft. Underwater dive crews are now working on setting the interlocking dowels for the connection of the base plug. The shafts will be finished with a heavily reinforced cast-in-place lining. Tunnelling is due to commence late in 2012 using a new Caterpillar EPBM, which is now nearing completion at the factory in Toronto. The 3.5m (11.5ft) o.d. machine will erect a 2.8m (9ft) i.d. fibre reinforced precast segmental liner, which is currently being manufactured at Armtec’s nearby facility in Richmond, BC. To date approximately 15% of the required rings for the tunnel have been cast. On completion of the tunnel drive and demobilization of the machine from the North Shaft, the 2.1m (6.8ft) i.d. steel watermain will be installed and grouted into place within the tunnel. Finally, the steel watermain will be installed in the shafts and surface cast in place valve chambers constructed. The TBM and associated systems are being designed with the aim of eliminating interventions; however, preparations are being made for hyperbaric entries as a contingency.